← These Boots Are Made For Walking? Red, aqua and gold surround visitors at the Queen Sofia Spanish Institute, punctuated with swirls of silk turbans and gowns of apricot and cornflower blue. All is framed by Fortuny fabric, paintings, photographs and Fortuny lamps. 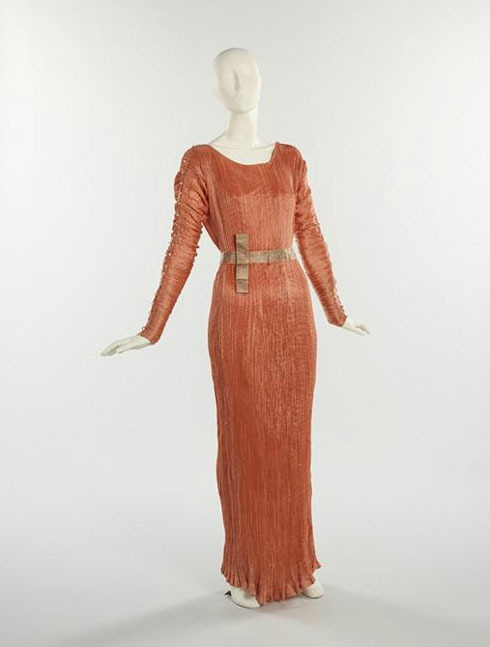 A Delphos dress greets visitors; it is Fortuny’s most familiar design, which he based on the chiton, a linen garment worn in Classical Greece. With its pleats and soft, columnar shape, Fortuny used the Delphos dress as a caryatid to visually support the patterns on his more substantial robes and scarves. These dramatic patterns, like the timeless silhouette of Delphos gown, recalled the past but were both a product of Fortuny’s innovative textile design methods; the complex technique Fortuny used to create the pleats is still not fully understood. Fortuny y Madrazo, Mariano. Delphos dress, circa 1930. Peach pleated silk gown with Venetian clear glass beads. From the Brooklyn Museum Costume Collection at the Metropolitan Museum of Art. Mariano Fortuny y Madrazo (1871 – 1949) was an artist, an innovator, and a collector. His hand-printed textiles and iconic Delphos dress are steeped in the patterns and designs of the past, recreated with a romantic and initially shockingly feminine shape. Fortuny y Madrazo: An Artistic Legacy links his work in fashion to the past while sharing Fortuny’s contributions to modern fashion design. Hailed as an artist who painted fabrics, Fortuny’s artistic heritage shares much of the exhibition space. Etchings, photographs, and paintings represent an artistic legacy that began with Fortuny’s great grandfather, José de Madrazo, whose portrait of Ingres hangs beside the work of his son, Federico de Madrazo, a central figure in Spanish Romanticism. Fortuny’s photographs of his time in Morocco, in Greece, and in Egypt pair well with his designs, and evoke a similar turquerie style and mood to his fashion photographs on display in the second gallery. In these photographs, a woman poses artistically to record Fortuny’s Delphos design. Oh, the many variations of Delphos gown! Fortuny disregarded fashion trends, instead created gowns of a similar style for over twenty years for clients like the Marchesa Casati, Isadora Duncan, Gloria Vanderbilt, and others. He designed the gowns in a multitude of colors, including soft pastels and the deepest jewel tones. Most striking are the small finishing details of each dress, like the delicate Murano glass beadwork that follows the edge of a neckline or a side slit. These details complete the first layer of Fortuny’s signature look, which was only complete with the addition of a colorful patterned scarf or robe. The patterns of the scarves and aljubas used as Fortuny’s canvases recall Sassanian motifs and designs from the Islamic and Coptic worlds. The kimono sleeves, the silk velvet, and the deliberately faded garments are both opulent and dramatic; one can imagine their fluid lines taking the shape of the women who wore them as they walked, talked and danced through elegant soirees, as gathered robes billowed at the smallest step, sleeves moved at the slightest wave of a hand, and metallic patterns shimmered with every turn. Fortuny’s recreated designs reveal our own fascination with the past, they reveal the glamour we place on the ephemeral. Fortuny y Madrazo: An Artistic Legacy will be at the Queen Sofia Institute until March 30, 2013. This entry was posted in Exhibition. Bookmark the permalink.